I've had six kids over three decades. Scrapbooking & Paper crafting keep me grounded. I love to teach others about scrapbooking & paper crafts. I hope you'll stay a few minutes and peek around! My youngest son recently turned one year old. We had a fun party for him…well, I guess you could say party for us. The first birthday party for us was more a great opportunity to gather family and friends to socialize, and of course to celebrate our little guy. Since he won’t remember the party, I wanted him to have something tangible to commemorate it. I made up a quick sign with instructions in My Digital Studio, put it in a picture frame, and set it out on a table next to blank Project Life cards and some journaling pens. Here’s how it looked set up at the party! 1) is the sign I made with MDS shown in detail above, in a blue frame (fun fact…the two blue frames shown in the picture here were originally used to hold table numbers at our wedding. I get sentimental pretty often). 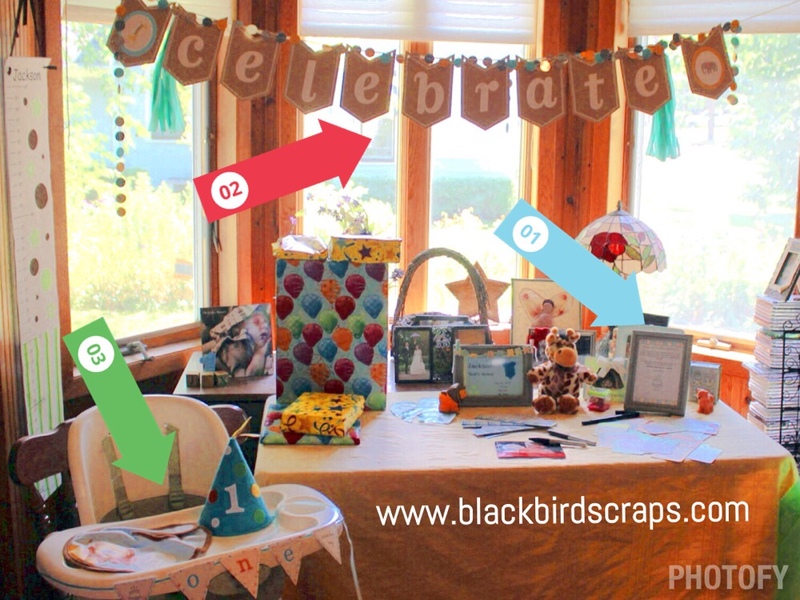 And as a side note I wanted to also show you the Celebrate banner (red arrow 2) that I jazzed up to match his zoo babies party theme by adding a sweet giraffe and elephants as accents. There are several blank frames in the kit to allow you to change up this banner and use it over and over for many different occasions. And the third green arrow is pointing to a little banner on Jackson’s high chair that I made with My Digital Studio in about 5 minutes, printed it, cut it out and glued ribbon on. Personalized, professional looking little addition that really added something. But back to the Project Life cards….. When the party was over, I had a priceless collection of cards to put into his Project Life album. 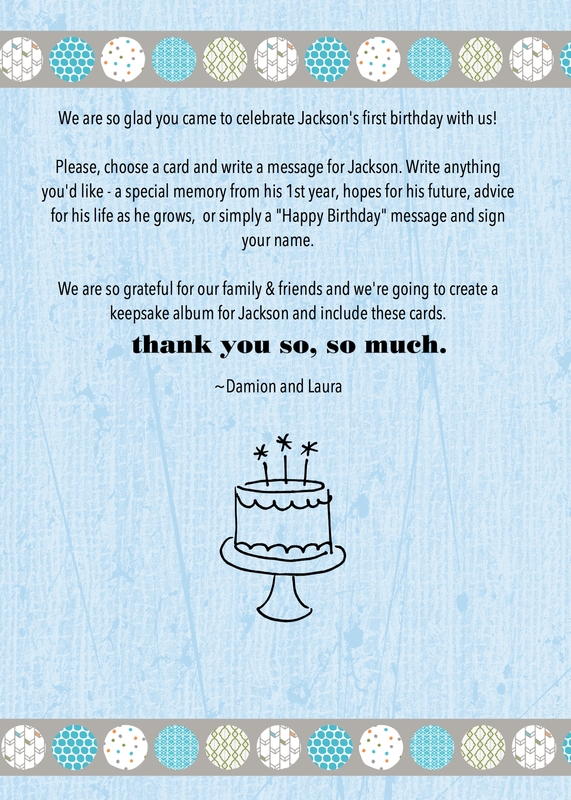 I of course love the things that his family and friends wrote, but I also love that the cards are each written in those special people’s handwriting. Now in one single album, my son will have greetings from his parents, siblings, grandparents, great-grandfathers, aunts, cousins, etc. I hope he will treasure this when he is older, and this is an easy way to collect memories from other people’s perspective. With three of my grandparents no longer with us, I treasure the handwriting and messages of family still with us. Birthday wishes written by big sisters, ages 11 & 12. What a keepsake this will be! Notes from Great-Grandpa & Grandma, in their handwriting. These are going into Jackson’s 1st Birthday Album-I’m using the 6×8 Espresso album and it’s the perfect size to hold lots of photos, memories and memorabilia about this very special occasion. 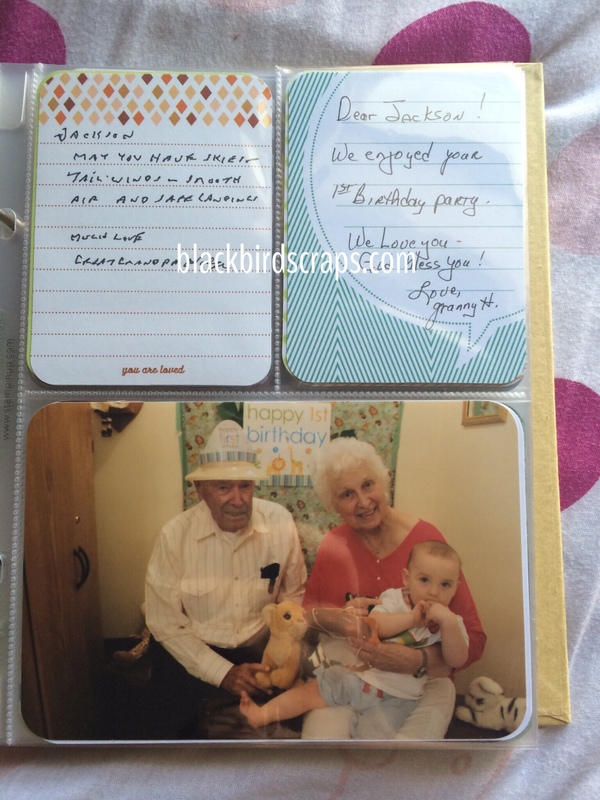 I also will put a couple pages about his birthday part at the end of his baby book, and a smaller insert page into the Family 2014 Project Life album that I have set up on a weekly system. 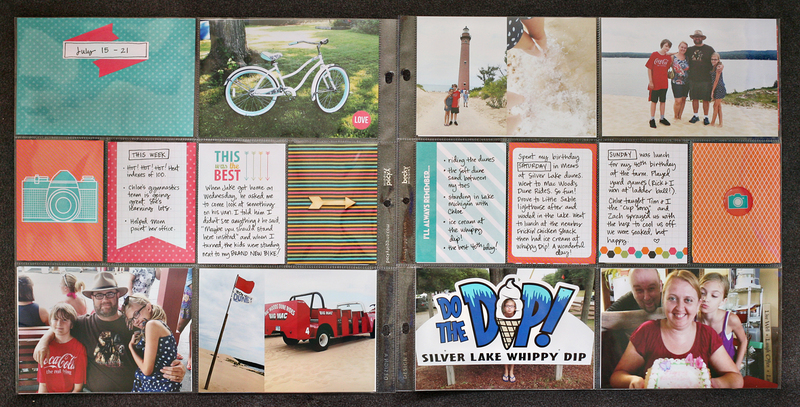 What I hope you take away from this is how versatile and useful the Project Life journaling cards can be! Imagine a set up similar to mine at a bridal shower or baby shower. Have guests write messages or advice to the bride-to-be, mom-to-be, or baby. Take a photo of each guest with the bride or mom to be, and put those photos in a small album along with the cards. That would be an amazing gift! This idea would work great as a wedding guest book idea too. The new Love Story cards are very romantic and sophisticated yet neutral enough to match any wedding style. I plan on doing this again next June when my oldest graduates High School! How fun will it be to send her off to college with a book of photos of her and her friends and family, along with personalized messages to her? I’d love to hear of other “out of the box” kinds of ways you use your Project Life journaling cards. Any tips to share? Thanks for reading, and happy scrapin’! Table by StampinBuddy. Try it FREE. Becky Higgins, the creator of the amazing memory keeping system called Project Life, has posted some awesome examples of the new Project Life by Stampin’ Up! ‘Everyday Adventures’ kit. Please, don’t let the layouts overwhelm you! While some of them do involve more advanced techniques, like cutting large photos apart to fit pocket pages, you’ll notice that ones like this one below are more simple. Look closely..this layout is simply 4×6 photographs slipped into pockets, and decorative and journaling cards from the Everyday Adventures kit slipped into the other pockets. That’s it. But these photographs are printed, not lost in a shoebox or someone’s computer, and their story is told with journaling. 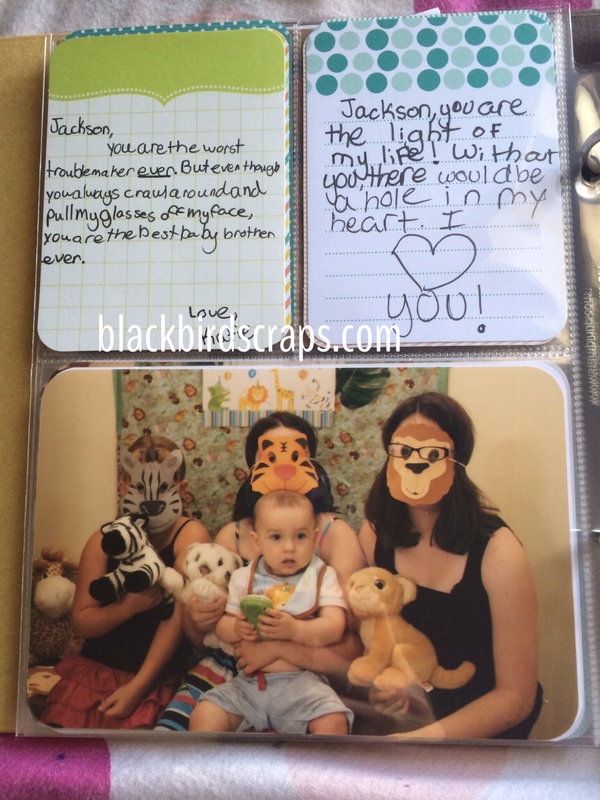 THAT is what scrapbooking is all about, in my opinion. Telling our stories behind our photos. And look how beautiful this simple page is! I would LOVE to help you get started with Project Life. Besides the Everday Adventures kit, three more exclusive Project Life by Stampin’ Up! kits will be available on June 2. Need a new catalog? Email me at blackbirdscraps@gmail.com and I’d be happy to send you one, anywhere in the US. The products will be viewable online starting June 2, and I’ll have some in person for you to see at my open house on June 8. 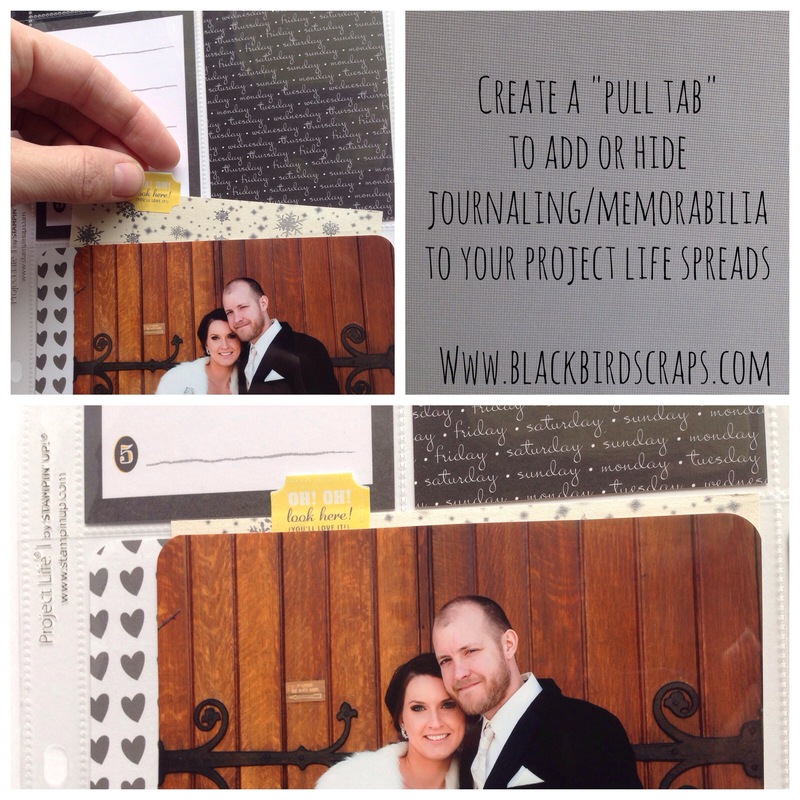 Use a pull tab to hide journaling or memorabilia in your Project Life album. I was having a really overwhelming day yesterday. I was short on sleep. The baby was just not into nap time. I was feeling overwhelmed by my to-do list and I was preoccupied with some worries. It’s so lovely how a piece of mail can completely change my mood. I was instantly happier. I received a thank you card & photo from a couple who’s wedding we attended in February. The groom has been a close family friend of mine since the day he was born and is the closest thing on this earth I had to a brother growing up. Not only was the photo of the couple lovely, but my dear friend wrote a personal note that was very touching. I immediately knew I wanted to add the photo to my Project Life spread for this week. And I knew I was going to hang on to that special note forever. But I wasn’t sure I wanted absolutely everyone reading it & frankly I didn’t want to use up another precious 4×6 pocket of this week’s page on that note. You could make a little pull tab out of so many different supplies. This is a technique I will surely use again and I’d love to see or hear about how you add “hidden” items to your Project Life pages. Visit Laura Dehnert's profile on Pinterest. Please choose Laura Dehnert as your SU Demonstrator when you sign up! Website copyright 2014, Laura Dehnert, Independent Stampin' Up! Demonstrator-All Rights Reserved. Images and artwork copyright Stampin' Up! and Laura Dehnert, Independent Stampin' Up! Demonstrator. The content of this blog and website is my sole responsibility as an Independent Stampin' Up! 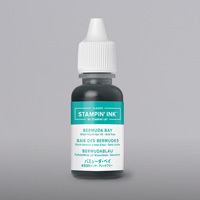 Demonstrator and the use of, and the content of the classes, services, or products offered is not endorsed by Stampin' Up! Some links may be referral or affiliate links which help to fund this website.